Hetty Feather is back and eagerly trying on her jewel-bright real name of Sapphire Battersea for size. Now aged fourteen and reunited with her mother, she dreams of a sparkly bright future for them both. Victorian reality being what it is however, Hetty must leave the Foundling Hospital and her Mama to go into service as a lowly maid to a wealthy writer. She hears at last from her darling foster brother Jem, although he soon has a rival in kind and fun-loving butcher’s boy, Bertie, who takes a real shine to the blossoming Hetty. But before long, her life takes a much darker turn, and many trials await. There is much to enjoy in this sequel to Hetty Feather, the middle book in a proposed trilogy. Wilson treats her readers to an eclectic range of Victorian settings from life below stairs with formidable housekeeper, Mrs Briskett, to the backstage goings-on at a circus freak show with female giant, Fantastic Freda. Though the drudgery of servant life and the stirrings of young love are nicely conjured, it feels less compelling a tale than that in the first book however: perhaps inevitably so, given that the inspiration for Hetty Feather was so rooted in the moving true narratives of children at the real Foundling Hospital. In the big bad Victorian world, where terrible things routinely befell poor children, Hetty also seems to encounter a remarkably high number of remarkably kind strangers. But Hetty fans won’t mind much, and will be left longing to find out what happens to their heroine in book three. 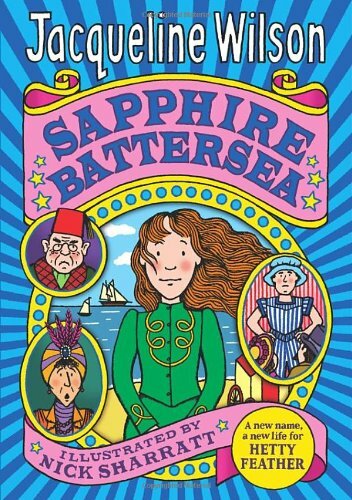 One thing’s for sure: exquisite a name as Sapphire Battersea is, it’s now even more difficult to think of her as anything but Hetty Feather.